Brief and to the point. If that’s your view of a recent meeting or phone call, could the same be said for your last presentation? Business meetings, committees and sales calls are judged by their brevity. And the same judgement applies to presentations; where less is definitely more. So, when it comes to your presentation length, then brevity is best. Because you don’t want that reputation as a long-winded speaker. Because, as a presenter, the advantages are clear. 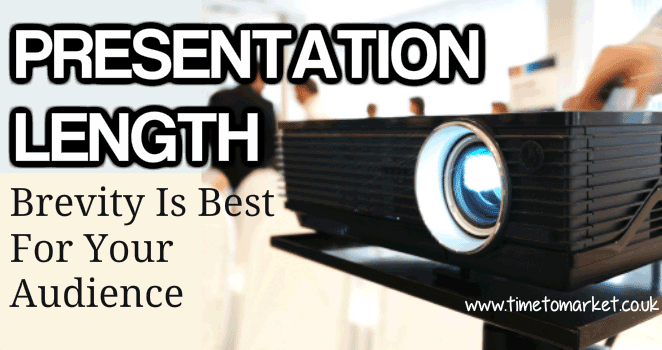 Presentations with a shorter presentation length are more concise and focused. Since they get to the point, make the point and summarise the point. There’s more attention on you. Your audience can focus on your content. There’s more time for questions. Your audience has time for discussion. Shorter presentation lengths don’t eat into an executive’s valuable time. But they do also allow time for an audience to ask questions and listen to the answers. Short presentations give an audience the chance to join a debate or discuss the implications of a presentation. Thus, they allow for insight. Some presenters use a 10: 20: 30 method. That’s ten slides, 20 minutes and 30 point. The rules allow for no more than ten slides, no more than 20 minutes and no text on the presentation to be less than 30 point size (very readable). The first two rules are self-explanatory. But what about the third one? When you keep the point size of your text on the large side, you focus on your key message. That’s core of your argument then. Because, with a text size of 30 points there’s simply no room for anything else! And there’s more. Because a 10: 20: 30 approach to your presentations also gives you plenty of time for questions, answers and subsequent insight into your subject. You can always find out more about your presentation design choices with our presenters tips. So, with all the focus on you and your content for twenty minutes, less is definitely more. We’ve looked at time planning for presenters with an earlier article. But you can also find out more presentation skills tips beyond presentation length on a PresentPerfectTM public presentation training course. And because you can train at more than 40 off-site training centres, you are never that far away.